Born in the small secluded town of Chewelah (Eastern Washington) Gregg began preparing for her music career early on. In grade school she began writing lyrics in the form of poetry and attending band practices with her father. She always knew she wanted to be a "rock star" but it wasn't until after her mother's death from cancer and later her father's suicide in her early twenties that she picked up a guitar and put her strong poetic words to music. The combination was endearing and potent. Gregg began performing in Spokane cafes and clubs, immediately creating a following with her intense and introspective music style. 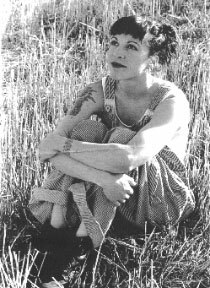 Drawing from her tumultuous life experience, she wrote and released her first nine song EP Giant (1996) dedicating it to her parents, featuring song "Daughter of a Madman." Gregg continued performing diligently and was rewarded by a growing acceptance. After performing at the Met for "Women in Folk" and opening for The Bob's, she was features on local radio stations and received rave publicity in the local press. Gregg then took on a band and put out her first CD, Prize (1997) which was immediately recognized by both critics and audience. The Seattle Rocket writes, "Her debut CD Prize, is a showcase for a voice that is at once powerful, biting and lovely. From the severe emotions of "Your Highness" to the gentler sentiments of the title track, this album digs and winds its way through Gregg's life and finds the musician and increasingly adept storyteller she's become." Gregg says, "I write songs about life," which is why her songs range from heart wrenching ballads to rock. Her ability to connect with her audience comes from a willingness to be genuine, allowing herself and her music to reflect what is really going on inside. Not only are audiences drawn to her strength, they are moved by her tenderness. These days, Gregg's music reveals another facet of her personality, her gift for appreciating the humor in life's ironies -- her lyrics begin to reveal the comic she undoubtedly is.